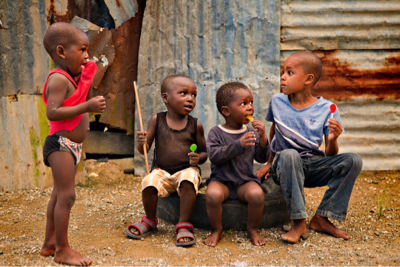 Isaiahsixeight is a Christian mission organization which focuses on an extremely poor area of eastern Jamaica. Please visit our web site: www.isaiahsixeight.org. Yes, my heart is really aching! 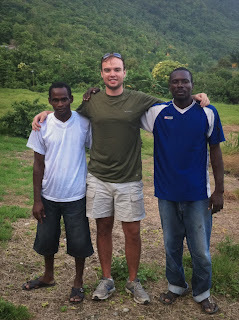 I just came back from Jamaica visiting the poor and making plans for future work there. What I saw was truly disturbing - profound poverty, despair, unemployment, hunger, homelessness, abandonment, etc. Yes, there was the sin, but there was also hope - not much in this world or this life, but in the one to come from the One to come. So, how can I be happy? Through years of work in Jamaica with these kinds of problems God has shown me how when we do unto the least of these, we are doing it unto Him (Matt 25:40). It brings me incredible joy and happiness to do things for Jesus, but neither the Isaiahsixeight mission nor I can do it alone and without support. The blessings are truly amazing! Wouldn't you also like to be a part of these blessings and to know more? · Has Isaiahsixeight been on vacation? Well, it might appear that way, but very far from the truth. A little over a year ago, Alabama suffered devastating losses from tornadoes. God called some of the leadership of Isaiahsixeight into the rebuilding effort and we built 3 homes with the cooperation of many churches, mission teams and very dedicated Christians. 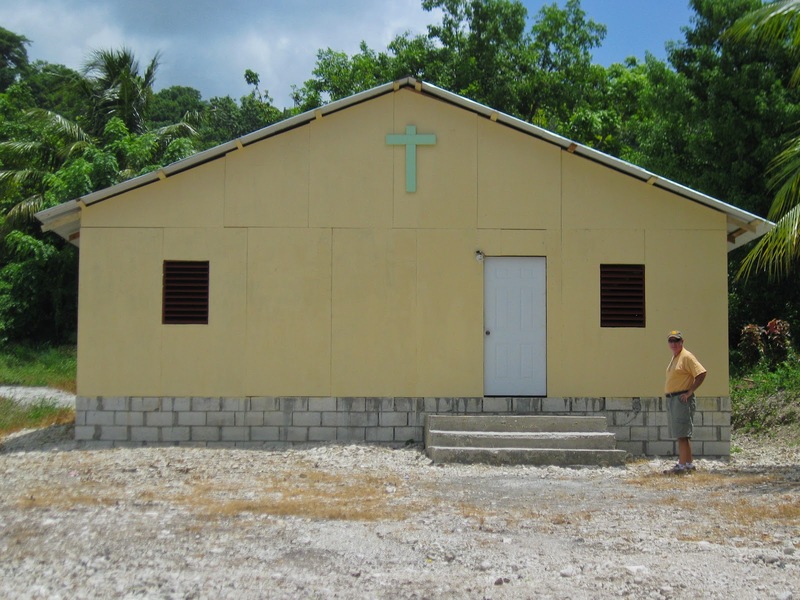 In July of last year, we had one team member to go to Jamaica, then in November of 2011, we took a small team down, all of whom had been involved in tornado home rebuilding, and we built a church in the Wheelerfield community in Jamaica. 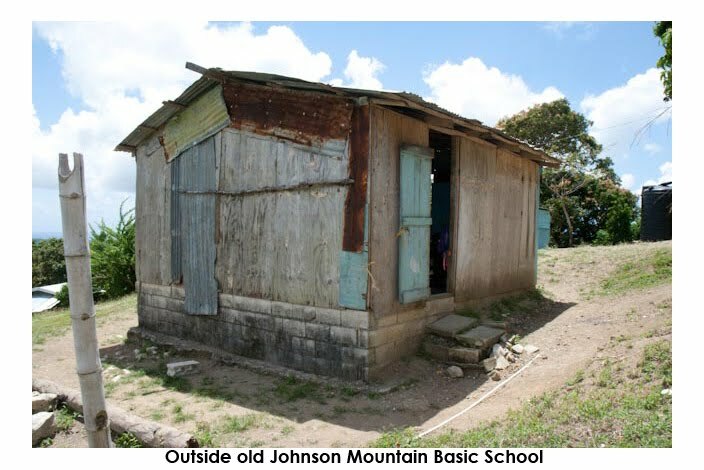 The tornado destroyed homes we built were completed in January 2012 and in that same month, some of us returned to Jamaica. We knew that the focus of most of our churches and members were on the local devastation and for a short time, Jamaica would have to take a back seat. 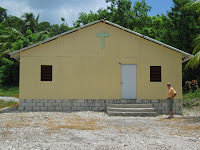 We learned a lot in building these houses, not the least of which is how God can make things happen if we are faithful. With renewed energy, renewed faith, and the knowledge that God is in control, we are taking some ambitious steps to enlarge His mission in Jamaica. · What does Isaiahsixeight do? That is a question I am often asked. Then, I am confronted on how to best answer that question. Usually my response is whatever God shows us to do. In our society, we are known best by our occupation. I believe God knows us differently - by our faith in Jesus Christ and what that faith motivates us to do. And what did Jesus tell us to do? Spread the Gospel, love God, love one another, feed his sheep, minister to the poor, the hungry, the homeless, the sick, the prisoner, and the dying. Our main Jamaican taxi driver for approximately 7 years has been on our heart a long time. We have shared the Gospel with him and he has witnessed our work first hand. We are closer to him than anyone in Jamaica. Even though, he supposedly accepted Christ about 4 years ago, we have seen only a little evidence that he is truly a Christian. Of course, that is probably true of many of us. We had also hoped he would take our movie system and move about the area showing Christian movies. We have pretty much concluded that our frequent visits will not change him. The only One who can change him is the Holy Spirit and a Jamaican that would be a role model would help. So, we just pray and wait on that. 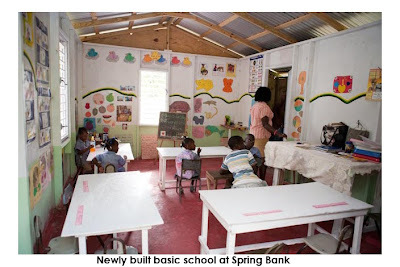 Then, about 5 years ago, we heard about a Basic School (similar to daycare/kindergarten) in the back of a church in Stokes Hall had been badly damaged by Hurricane Dean and was in terrible shape. We go visit it and agree. We pledge to come back to build a new one. We build it. Then a year or so later, we come back to do major structural repairs on the church including a roof. We become very close to that community. Then, I see a malnourished child who is in the Basic School. To combat the malnourishment, I start investigating the feeding programs of the basic schools and the government involvement. This leads me to visit several basic schools, then to contact the national governmental officials in charge of the feeding programs. There, I learn that the teacher was at fault as to why this basic school does not participate and will not in the foreseeable future. All of this lead me to talk to the board chairman of the basic school. At that point, she tells me she is pastoring a small church in Wheelerfield and they need a church building. We had already decided that building a church was not in our plans, but to be nice, I agreed to go visit the area and see what she wanted. We had a lady team member there and I asked her to go with me, even though, to this day I do not know why, but God told me I should take her. Well, who greeted us there, but 4 young children. While they did not say much to me, they approached the pastor and the lady team member for food because they were hungry. As we are walking across the field to look at a possible church site, I am telling myself that we are not going to build this church. Hunger is the main problem and not lack of a building. But, then I am told that this was a church plant from the Stokes Hall church and they started it for the children of the area. So, this was a mission church to help the hungry children. God knew that would break my cold heart. 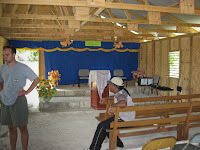 So, with the consent of our leadership, we built the church in November of 2011. This building project was probably our largest ever and we had a small team of 5-6 Americans and we actually helped another team on another project for the first 2 days of that week. So, we needed a lot of Jamaican help and we got some of the best help we have had and the most community support. One Jamaican man, Courtney, in his early thirties was most impressive. He was a hard worker, ingenious, poor, had 5 children, a wife, and was an active member of the church. Just last week, we went to the church and they have done a lot of work there since we left. We saw Courtney again. On Saturday night, we went up into the mountains past Courtney's home to play bingo and show a Christian movie in the community of Johnson Mountain where we have built a basic school which is the center of a renewed spirit in the community. The bingo was a fundraiser for a community farming project to provide jobs for 17-27 year olds. This was lead by a very nice Rastafarian. We picked Courtney up on our way up the mountain. He was amazed at the movie and is now on fire to show it to his congregation and others. We also gave him Bible study materials and he wants to get our taxi driver to go with him as a team to share the Gospel message via a movie ministry. So, God had it all figured out, we were just a little slow. So, building a school which lead to a church restoration which lead to a relationship to a community which led us to see malnutrition in that community which lead us to talk to the school board chairman who happened to be the pastor of the mission church. Traveling with the mission pastor, we again saw hungry children which caused us to build the church where we met Courtney. We go to Johnson Mountain at the request of the leading citizen - a Rastafarian who wants us to help with their farming project as well as show a Christian movie. We take Courtney with us. Courtney is amazed at the movie and now wants to team up with our taxi driver (remember this started with him). Also, the taxi driver really admires Courtney and I pray this will ignite him. So, what do we do in Jamaica? Pretty much anything that God shows us. As with the stories of Jesus, you cannot separate the faith stories, the Gospel, or the mercy ministries. It is all a part of building the Kingdom. Incidentally, the church I did not want us to build has about doubled since November, has had four Baptisms, has two more scheduled and Chef, a good friend of Courtney's who has 8 children, was baptized and will soon marry the mother of his children. As you can see, this all was the work of God and is to His Glory and is an example of what we do in Jamaica. · I'm a Thief for Christ! For years, we have been visiting an elderly stroke victim named Ms. Rita. She is a delightful person. Our helper there in the community, Audrey Lindsey, has been delivering soup to Ms. Rita monthly for many years as well. We almost did major repairs on Ms. Rita's home, when much to our surprise, a son did the work. He, however, did not paint the house. So, Bradley, a 21 year old college student with a heart for Jamaica and I, started looking around the house. I was photographing it for documentation for the amount of paint and work. Bradley disappeared around back. There, I found him in deep conversation with a Jamaica woman. Bradley told me that the woman had a special needs child with hydrocephalus (water in the brain). I peer around the door and met the mother, Michelle and her 3 year old girl, Sosheba. Michelle is renting a room from Ms. Rita, for $12 per month. This room is about 8 feet square, contains a full size bed and little else. There is less than 2 feet of space at the end and one side of the bed. Sosheba is lying on the bed, in a Pampers, thrashing about. Occasionally, she will giggle and smile. She is obviously malnourished, her head too big for her body, and her limbs too frail to support her. Michelle, tells for her love of the child, that she could never put her in a home for the handicap, that no one will babysit for her, and that she cannot leave her alone. Someone has given her a stroller and a medical mission team had left some children's books, but nothing else. The child sleeps in the bed with the mom, there is nothing to keep her from falling out of the bed, there are no toys, and the child stares at a dark tin roof and old dark unpainted walls. The is one light bulb in the corner attached to a small extension cord. To make it worse, Michelle tells of her need for Pampers, her need for food for the child, and the fact that the child cannot chew and must have all her food mashed up and how difficult that can be. Of course, we see all this on late Saturday afternoon and we are leaving the island the next morning, so what to do. Audrey was also devastated that she had been to that house so many times and did not know the child was there. I immediately asked her to buy a playpen for the child (which will have to be used outdoors because of lack of space), buy eggs, meat, nuts, cheese, and beans to help meet the protein needs of the child, buy some rattles she can grasp, possibly a mobile and help in other ways as well. Then, without permission and without regret, I stole! I stole a blender belonging to the Langer's, missionaries to Jamaica, and asked Audrey to give it to Michelle. Getting protein to this child is a problem on many fronts - money, blending or mashing the food, and they have no refrigeration and even if we bought a refrigerator, they could not afford the power to run it. Michelle and Sosheba need more room as well. I think they just made it to the top of our list to for us to build them a home. Michelle is a Christian and a member of a Pentecostal Church. She reads her Bible regularly and reads it to a gentle Rastafarian man who helps her with the child. She certainly has faith and the hope that Christ gives us, but as Christians we need to help her and her child. I am contemplating returning to Jamaica soon - with toys, protein powder, and to help Michelle which would include trying to improve her housing situation. He was blind, lame, and lost, but now he is found! A few minutes after finding the lady with the special needs child, we met a great Christian man helping a elderly lady with amputated leg who we had already visited. He was telling about a man who had recently lost his leg to diabetes who formerly lived in the area. He had heard he had moved to the Seaside community and was in a terrible living situation. So, off we go to visit this man. We find him. 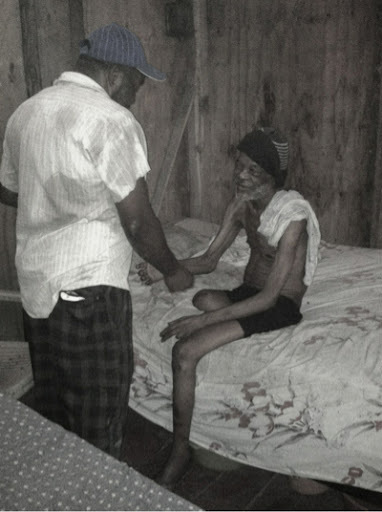 He is elderly and living with his elderly sister in a two room house, where one of the rooms was uninhabitable. We entered. The room was dark with most of the light coming from the cracks and breaks in the floor. The source of the light was also the only source of ventilation. He was living in a house with a tin roof and plywood walls, but there was only a door - no windows whatsoever. There was also no electricity. My immediate concern was for light, but when I learned that not only did he have but one leg, but that he was blind, my concern about light was not an issue. We originally thought the main problem would be the stability of the floor, but we soon recognized that ventilation and nutrition where the main problems. We thought putting in windows would be a great project for a team from Birmingham-Southern College expected in January, because we were leaving the island the next day. Then we put ourselves in his shoes and realized this needed to be finished soon since it is summer. So, we have made arrangements to pay a Jamaican carpenter to take care of the windows. In talking to Audrey about this man, for years, he had been a recipient of the soup from their soup kitchen for shut-ins, but he moved and was lost to them. Now he is found and God can now bless him with windows and soup. Sometimes, God has to hit us over the head twice. Early in our recent trip, we were walking through the Seaside shanty community. My good friend and fellow Jamaican missionary Terry Fry told me as we passed this pink house that the woman there on the front porch just really seemed desperate. She frequently asks us for help, but I usually shun her because of the coarse almost demanding way she asks. The next week, we were again in the community, but Terry had left the island several days earlier. I recalled what Terry had said and as I walked by, she asked me for some money. We normally do not give money out (see comment below), but I went to talk to her. Her daughter and the daughter's two little boys (one still nursing) live with her. She was cutting cabbage for the evening meal and that is all she had. She wanted me to help them buy some rice and oil to add to the cabbage. I gave her the equivalent of about $2 US and she did indeed buy the rice and oil. Later, I wondered, how many other times had she asked and how hungry were they? God taught me, I need to look beyond the words and manner in which they are spoken and look at the need. Comment - While we almost never give out money, I saw so many desperate hungry people who I know, that I could not follow my own rule. One of the most honest hardworking Jamaicans I know, for the first time in the ten years I have known him asked for some money. Since he is a long time friend, I could not say "no". I also gave money to several elderly women and men. Poverty is a vicious cycle. We as Christians want to share the Gospel with the poor, but is that enough? Can a hungry person listen? Can an uneducated person read their Bible? Can they get a job? Every day, especially near the end of the school week, we see a lot of children who should be in school, but they are not. Ask them why and in descending frequency, you hear the following excuses: no money for school fare (transportation to school), no lunch or money for lunch, no breakfast, no uniform, no shoes, cannot pay the fees. The little ones are in a similar shape. They go to Basic Schools (a kindergarten-like program). The fees for these are about $3 US per week and lunch is about $1 per day, but people cannot afford this. So, the absences are frequent. The schools do not collect the fees and they have to feed some of the children for free. There are government regulations for these schools, but very little financial support. Some, but not all of these schools have electricity, but they do not burn lights because of the cost. Many leak and others look like caves. Studies have shown that child sponsorship programs do work. Siblings from the same homes in the same community have been shown to do better in school and in life if they were supported by a child sponsorship program. 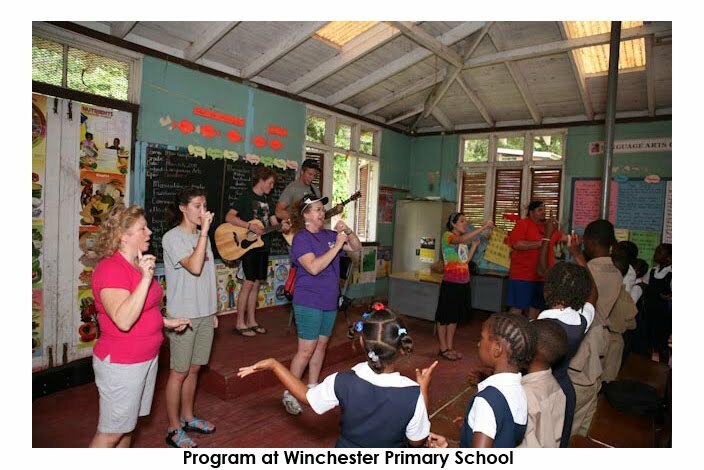 We have given this a lot of thought and have decided to begin this fall semester working primarily in the Chapel Hill Basic School that serves much of the Seaside community. We hope to expand this in to the larger Seaside community to include older children in other schools, into other basic schools, and into other communities we serve as well. A secondary goal is also allow the increased collection of fees to help the basic schools. We are having discussions about combining several of the basic schools if a suitable location can be obtained. If we do this, we will have to support them to some degree and we pray that motivated educators of children will hear the call and join us in improving the schools there. Expect to hear more about child sponsorship in the future and also read the article about our first employee. 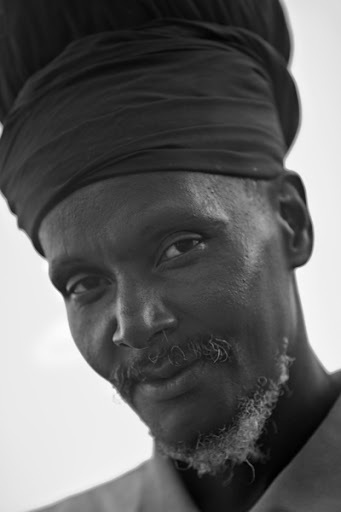 · What does a Rastafarian, marijuana, and our mission have in common? God must have a sense of humor! 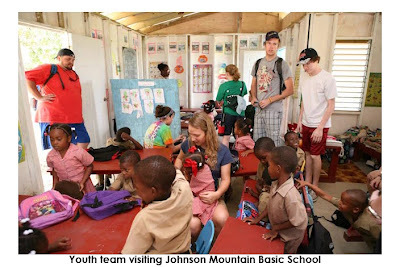 Several years ago, we go to the community of Johnson Mountain. It is an agricultural community on the side of this large mountain. Before we go up there, we hear two things: first, they have a terrible basic school that needs to be replaced and secondly, the area is known as one of the major marijuana growing areas. We go, see the tremendous need and like the people we meet. One is the community leader, a very tall, kind, well spoken Rastafarian. We took a great team from Birmingham up there in January 2011 and built them a school. Approximately two months later, we visit them, find that the enrollment is up about 50% and everyone tells us the school is the new central point of pride in the community. On trip two weeks ago, we go up there to visit and check on them and we hear they are working with an agricultural development arm of the European Union and are planning to do a cooperative farming project to raise and process ginger. However, they need some money to pay for a bulldozer to cut the road. The European Union is doing this project to try to make jobs for 17-27 year olds. We are all for jobs and opportunities, so we talk more about it. I asked the Rastafarian leader, with the red eyes of marijuana usage, if we could come up the next weekend and show a Christian movie to the community and we could also play bingo (I have an iPad app that automates and projects the bingo calling). He loved the idea and suggested we charge for the bingo and use the proceeds of the farming project. Well, on Saturday night, we go there. We show a Veggie Tales movie for the children and 4 Three Stooges shorts. Then when we have a crowd and ready to play bingo, the Rastafarian asks me to open the proceedings with prayer. Now, Rastafarians believe in a god and they think it is our God, but they have their own "messiah". So, I made sure my prayer invoked the name of Jesus Christ. We played 5 games of bingo and the Jamaicans really enjoyed it. Many then left, but quite a few stayed including the Rastafarian as we watch "The Hope" video, an outstanding presentation of the Gospel. Incidentally, I am participating in a study about how to start spiritual conversations naturally. Was this natural or supernatural? God certainly had me scratching my bald head! Isaiahsixeight hires its first employee! We have been working in Jamaica since the early 1990's, and Isaiahsixeight came into existence in 2007. Everything has been done by volunteers except for the occasional casual Jamaican laborer or a short contract job. Most of our work in Jamaica that is done when we have not been there has been done by Audrey Lindsay, but Audrey is a fulltime basic school teacher, a lay minister, steward of the church, runs a Seaside children's ministry and is busy in many other church and community causes. So, while she is very dedicated to our mission and our causes, she has no time for additional activities. We knew that starting a child sponsorship program would take a lot of work on the Jamaican end and someone to do it, so we went to Jamaica on this last trip with the main purpose of finding that person. We had some preconceived ideas about who that person might be, but almost immediately, God showed us that those people would not be our employee. I was sharing our plight with Mrs. Jacobs, the proprietor of the local hardware store when she told me about her daughter, Freddi. Later that week, Mrs. Jacobs met with Audrey and us. Then a few nights later, she brings her two delightful daughters - Freddi and Sandi. Freddi is an intelligent 26 y/o lady who graduated college studying pharmacology, then got something akin to a masters degree in epidemiology. She wants to enter medical school and become a pediatrician. She is a Christian, technologically savvy, is well spoken, energetic and self motivated. God sent us what we could not imagine; however, Freddi can only promise us 10 weeks of work until school starts. Freddi is already cataloging the children, meeting the teachers, chronicling the needs, preparing Bible studies and summer programs for the children in Seaside, working to help us find jobs for some of the brighter older children in Seaside, reading books I recommended, installing apps and learning software that we will need to communicate, track expenses, and track the children. All I can say is "Thank You God!" and "Welcome Aboard Freddi!" I believe as you can see from these stories that God is moving in many areas of our mission. We have had no fundraisers in over a year. The tornadoes, the economy, and probably my failure to tell the story have all hurt our contributions. Also, we have taken fewer teams to Jamaica in part due to donor and volunteer fatigue (including my own) related to the tornadoes. ● Creative people to maintain a FaceBook presence. ● Prayers, prayers, and more prayers for guidance, wisdom, and appropriate responses to the needs before us. We pray that you are touched by these stories and will come alone side us to help this mission. To God be the Glory! It has been a while since we have written a newsletter. Not because we have had nothing to write, quite the contrary. We have been so busy in Jamaica that we have had little time to write. God has been showing us a lot of need, and we pray that you will help us meet those needs. We have spent little time on fundraising recently; however, we must change this because we are doing more, working in more areas, and making a larger impact. Please read below about what we are doing and if you cannot join one of our teams, please pray for us and consider helping us financially. We now have a Jamaican subsidiary corporation. IS68 Jamaica, Ltd. is incorporated as a nonprofit charitable corporation in Jamaica. This will allow us to act as a business in Jamaica - to enter into contracts, leases, purchase agreements, etc. We have also filed for a tax-exempt status as well and that is pending. This would be a huge help since we pay 17.5% General Consumption Tax on things we purchase in Jamaica. Please pray for this status. Isaiahsixeight is becoming better known in the area. In February, a mission team from Missouri led by Bobbie and Hank Langer, former long-term missionaries to Jamaica, used our rented house there in Jamaica. Technically they are not a part of Isaiahsixeight. However, as they traveled around to many communities, people introduced them as Isaiahsixeight. They were so pleased to find that Isaiahsixeight had such a good name in the area, so they did not correct the Jamaicans. We now welcome the Missouri team as the Missouri branch of Isaiahsixeight. 180 people were fed a hot meal, cake, and ice cream at the church. the remaining 30 were adults who also received a bag of groceries. The bags contained: 4lb of rice, 4lb of sugar, 4 lb of flour, 2 lb of cornmeal, a can of mackerel, a can of sardines, salt fish, crackers, vegetable oil, cocoa, toilet paper, bath soap, laundry soap, matches, Lasco soy food drink powder, and salt. This is enough food for about two weeks. Another 35 who were sick and elderly had a bag of groceries delivered to them also. 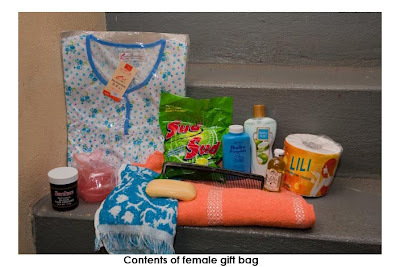 24 men at the indigent nursing home received gift bags containing underwear, towels, skin lotion, olive oil for skin, soap, soap dish, comb, a washcloth, and oil for their hair. 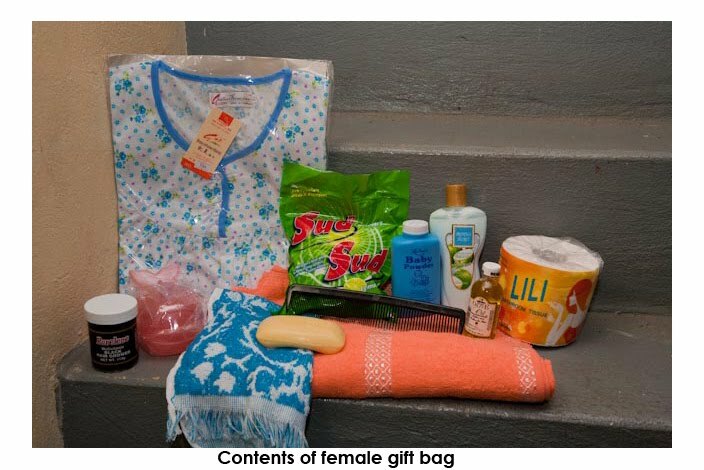 15 women at the indigent nursing home received gift bags containing a house dress, towels, skin lotion, powder, olive oil for skin, soap, soap dish, comb, a washcloth, and oil for their hair. Since our last newsletter, we can report that we have two new basic school buildings in operation. The first was in Spring Bank. This project was difficult because we could not count on community support. Then there is Johnson Mountain, another mountain community. We had planned to build a basic school there last summer, but because of the social unrest in Jamaica, we had to cancel that trip. It was, however, the main target of our mission team in January of this year. This was a wonderful project in almost every respect. It was greatly needed, it was in a poor rural area, the teacher had been praying and asking for help for years, the community came out to support us and the we were much appreciated. A look at the photos of the school (below) can give you some appreciation of the situation. While the condition of the old school was not the worst we have encountered, it was quite bad. It was built with scrap wood and tin. It was dark inside; and the desks were probably over 50 years old. Many were rotten. The chairs were broken. The adjacent toilet building was built with sticks instead of cut lumber. The hinges on the doors were pieces of old car tires. Our team poured concrete footings for an extension of the school, demolished the old school, added a small porch, steps and rails, built a new toilet building, and built a new bus stop for children waiting for buses and taxis. In addition, through an arrangement with another mission organization operating in Jamaica, we were able to buy children's chairs and get some legs for tables. The Missouri team provided labor to build new tables for the classroom. We also donated them some educational electronic games, books, balls, chalk, etc. One of our mission leaders who was not there for the building project, but who had visited both Spring Bank and Johnson Mountain on previous trips and was amazed at the change in the teachers. When we had met them on previous occasions, they seemed depressed and without much joy. After moving into their new schools, they were radiant, joyful and smiling all the time. The Johnson Mountain School only had 22 students in January, but had grown to 29 by March. In March, we visited Market Road Basic School - probably the closest one to our rented house. We had heard many years ago that they were having difficulty due to a church - school dispute as well as some politics associated with the school. We were advised to steer clear of it until things had sorted out. Well, that time finally came. We were asked to visit because they needed as piece of plywood and could not afford to buy one. On our visit, we found a very depressing place. They had occupied a non-completed addition on the back of a church. Some materials had been donated and a few of the parents had done some work there. They needed a door to separate their bathrooms from their classroom. Also, they had pieces of tin over the window openings and had flexed the tin up to allow for ventilation. However, one opening was larger than a piece of tin, so they had rain coming in. In March, we went there and built a partition and door to separate the bathroom from the classroom and solved the rain problem as well. As depressing as that may seem, it gets worse. The school's lease on this space ran out in August 2010. They have no place to go, no property, and certainly no money. We are praying that God will show us a solution for these 32 children. We continue to take educational materials to the area. 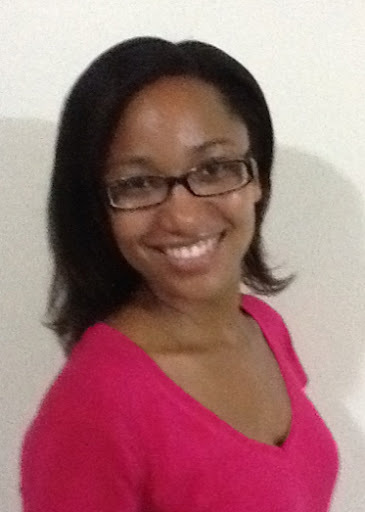 Audrey, our Jamaican liaison, works in a basic school and is part of a cluster of at least 8 other basic schools. She also has a relationship with the teacher at the Special Needs School. Every time we take supplies there, she distributes them among these schools. For years, we have seen great needs in these schools - financial, building, resources, materials, teacher training, etc. In the past our mission teams have been mostly composed of men - none of whom are trained in education of children. We knew how to build schools, but other than bringing them a few supplies, we did little to help with the education of these children. We have been praying for and trying to recruit people who have teaching skills, a heart for children, and the ability to help in these areas. We think someone who traveled with us in January can help supply these needs and is eager to get very involved. Please be in prayer that this person will continue to be used by God for these children in Jamaica. Several years ago we had a photo of a little boy who appeared to have protein malnutrition. We started to investigate further and found that many children go to school hungry and may only have water or a Kool-Aid like drink with a very small bag of cheese curls for lunch. As we began to investigate this, we learned of a government program back by USAID and the World Food Bank that for a very small amount of money has provided some nutritious foods to the children in schools. After research, we contacted those government agencies in Jamaica. On a recent trip, we met with several of the sponsoring boards of these basic schools. Then we went back to the government only to find that because of funding problems in Jamaica, that they would not allow these basic schools to rejoin the program. So, we do not have an answer for this problem. Please be in prayer that God will show us a way. We have recently visited the Winchester community. It has a primary school (grades 1-6) in what is essentially a large one room school building. The school is very old and has some structural problems, but we were very impressed with the staff and the discipline we saw at the school. They asked us to consider helping them build a basic school since there is no basic school in the area. This means that many of the children do not have a preschool option prior to 1st grade. Adjacent to the primary school is an old abandoned house that once was the principal's house. The roof is rotten, caving in, and is not the home of bats (the flying kind) and old desks. We are contemplating replacing the roof and making minor repairs to make it function as a basic school and a computer lab for the primary school. As usual, we see one problem and there is another disturbing one as well. The toilets for the primary school are on a hill side and are just large outhouses. The pits beneath them are deep and dark. The seats are made out of plywood and have very large openings. As one could imagine, the very small children are afraid to use them. So, frequently they do not. They will go to the backroom in a corner of the school or in the floor of the outhouse to avoid these deep scary toilets. So, as we renovate the house, we will also try to install modern flush toilets and make it a more modern and less frightening place for the young children. 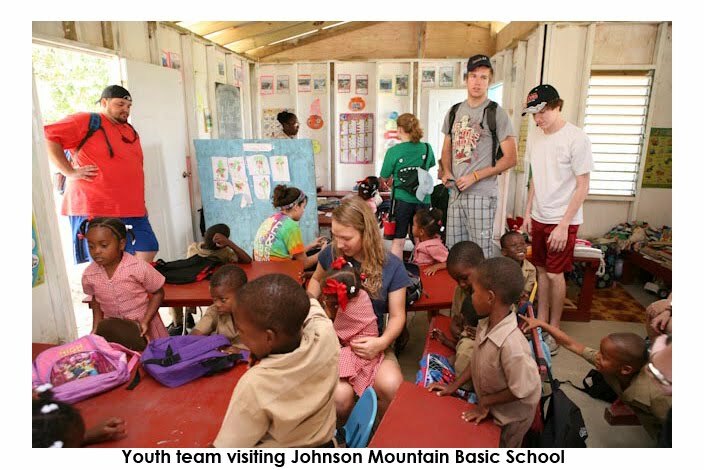 Our last several mission teams have visited the following basic schools: Johnson Mountain, Spring Bank, Stokes Hall, Chapel Hill, and Market Road. We also visited Winchester Primary School and the Lysson's Special Needs School. In some, we had a music team perform and sing with the children. In others we played with the children, helped them with their work, and delivered vitamins, educational electronic games/toy computers, a laptop computer, balls, school supplies, books, etc. In March, we had a youth team with musicians and a children's pastor. So, we conducted Bible schools for children. This was a little difficult because while it was Spring Break here at home, it was not in Jamaica. So, the children where in schools. So, we conducted them as late afternoon/evening programs. On Monday and Tuesday, we had Bible school from 4 PM until 7 PM in Stokes Hall at the Jamaica Evangelistic Association Church. We had over 100 people there both nights. We had singing, skits, crafts, play time, and a small sandwich and drink for all participants. We repeated this on Thursday and Friday nights at the Port Morant Methodist Church. Also, on Saturday afternoon, we had a version of Bible school with a movie at the Port Morant Methodist Church as well. We had more than 100 children at the Port Morant functions. 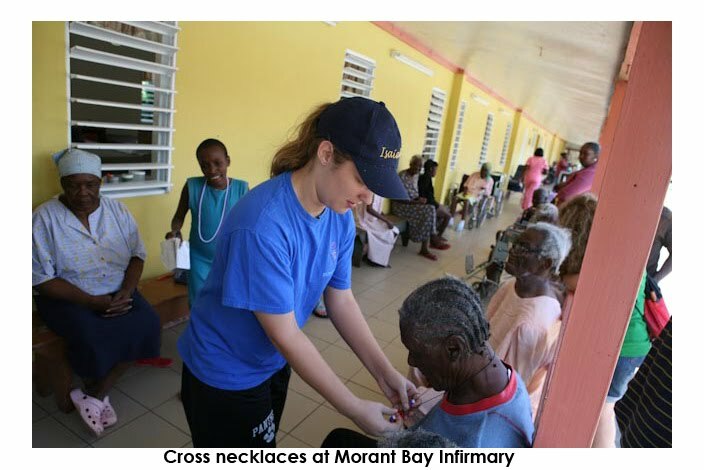 Prior to the Bible school on Saturday, the team participated with the Port Morant Methodist soup kitchen to prepare and deliver lunch to some of the sick and the elderly in the area. While the team was showing the movie on Saturday, a two of us went to visit a church in the Wheelerfield community. 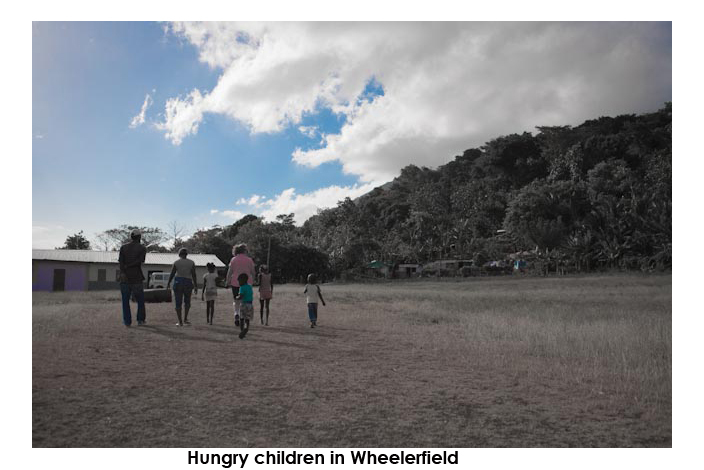 Wheelerfield is a very poor area where the predominate employment is manual cutting of sugar cane. A cane cutter usually works in a team of two with one cutting sugar cane and the other stacking it. Because the cane is burned prior to harvesting, it is covered with ashes and soot. They begin cutting about 5 AM in the morning and finish about 4 PM working in full sun with temperatures into the mid 90's. A good pair can cut and stack 10 tons per day, with each one making only $16.35 USD per day. If they are lucky, they may work 3 days per week. Also, gasoline, building materials and most food items are more expensive there than here. 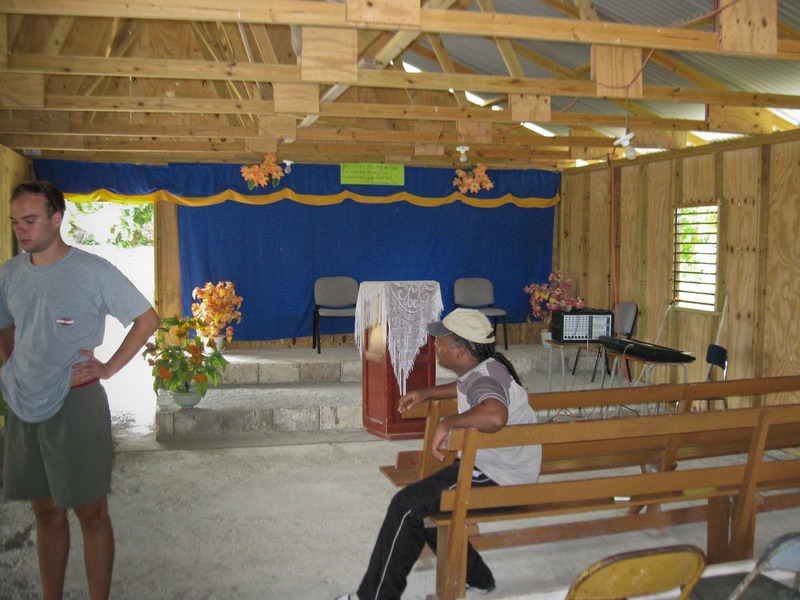 We went to this community because in one of the meetings with a school board member, I was asked by a chairman of the board to visit her church as see if we could help them with a building. It is a long story, but to make it short, we went just to be nice and expecting to politely say we would not build the church. As we talked with the pastor, we learned that she was a nurse at the sugar factory (almost all pastors earn their living doing something other than being a pastor) and was a member of the Stokes Hall branch of the Jamaica Evangelistic Association Church. We have a long track record with that church. This lady started a mission to the children in the Wheelerfield area many years ago, which eventually grew into the largest church in the area, but they have no building and are meeting in a multiuse community center. Well, while we are there, some children came to the pastor and asked if she had brought any food. Then they were walking with our children's minister (from Alabama) and one of the little girls asked her: "Miss, do you have any F. O. O. D. (spelling it out)?" This visit truly troubled us. Even Audrey, our Jamaican liaison, was concerned that there were some significant hunger issues there. She has pledged to research it further and visit again as well as take some food there. As an organization, we have been trying to get out of the church building business, but this one is serving a very needy community, started as a mission, and it would seem that the pastor has probably been involved in helping feed the children. Will we be building this church? Probably if God will provide the money. So, expect this as a future team building project. 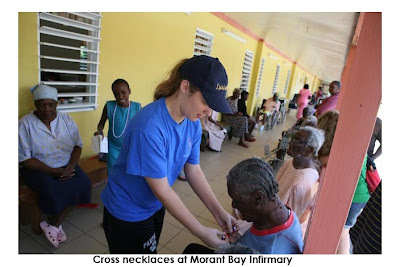 Approximately one year ago, we visited the Morant Bay Infirmary which is the indigent nursing home in the area. As you can imagine with the poverty in the area and a dysfunctional government, this place is really in need. When we first went there, their washing machine was out and they were having to so their laundry by hand in sinks. Even some of the residents were having to wash their own clothes by hand. Flies covered the soiled linen. We purchased a commercial washing machine for the facility. On subsequent trips, we noticed how crowded the facility was. Patients have no privacy and no place to store personal belonging. There only chairs for the residents are on the veranda; in the wards, they only have their beds. The residents have no tables for food and must eat on a plate sitting in their lap. The evening meals are very sparse as well. We were encourage to see that the Chase Foundation (Jamaica's foundation that distributes the income from their national lottery) had decided to build them a large new dormitory with smaller rooms and hopefully more privacy. It was completed last Fall. When examining our photos from a trip last summer, we noticed something missing - pillows. Only about 25% of residents had pillows. So, we had our agents there to purchase pillows, but they were not distributed because they wanted to save them for the new unit (not our plans). So, on our January trip, we had our work team distribute the pillows to the residents. Of course, we expected to see the new dormitory operational. It was completed in the Fall, however, it was not being used. Even in March, it sat empty. After inquiring the reason, we learned they had no money to install a septic system for the unit. We have our agents there in Jamaica studying this to find out what it would cost to get a septic system installed. We may need to involve ourselves with this. This is typical in Jamaica. There is something also ironic. One day we may see this unit functioning with a large sign on it that states it was built by lottery money. Of course it might be made usable by God's money, but that plaque may be on a septic system and underground. Our youth team in March visited the nursing home and played music with some of the residents joining us in singing. We had a treat when one blind lady started singing one of their spirituals we did not know. Three other women joined her. It was quite emotional. When we were singing, one of our team members took a necklace they had made in the Bible Schools and placed it around the neck of one of the lady residents. Our Jamaican taxi driver, Devin, got emotional and gave his necklace and another cross necklace to some of the residents. I asked him about where he got the cross necklace. He said, with a tear in his eye, that Brenda from the Missouri mission team had left him a whole box of them to give out when the time was right. He said: "I think the time is right." I told him to drive home and get them and come back. He did and a cross was placed around the neck of every resident at the home. It was truly a special God time! Lastly, we will talk about the Seaside community. It is certainly not last in our hearts but rather an ongoing area of mission for us. For years, we have been building homes in the shanty town near the ocean and we have helped the children there with clothes, shoes, Christmas, and school supplies amongst other things. In the past, we have sent some young ladies from there to church camps in the summer. Some of these ladies have grown up and now are assisting with Bible schools, basic schools, and are working on advanced degrees. There are many children in this area. We have helped several mothers gain skills and materials to provide for their families as well. The children know immediately when we are on the island. Most of them walk past our house every morning on their way to the primary school. On our last trip, we were making lunch for approximately 20 of them each morning. They would start coming to our door at 7:30 AM. We also left a lot of peanut butter and other food so our landlord (Ms. Patsy) can continue to feed them. We also brought clothes and shoes again for them. Of course we always make several trips to Seaside to see the children and play with them. 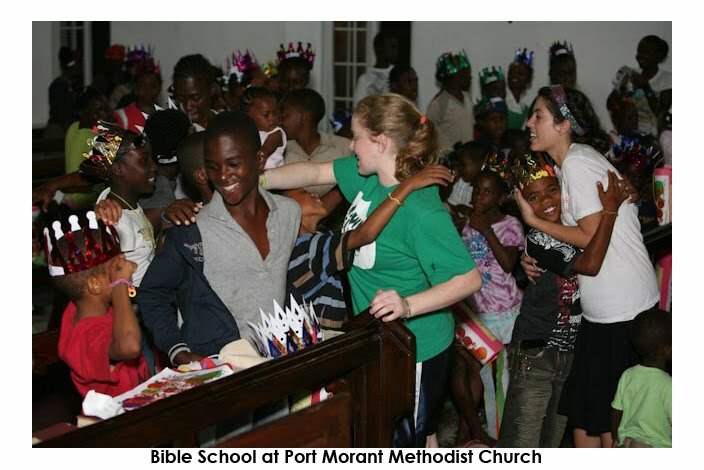 They also were many of the children who attend the Port Morant Methodist Bible school, so we see them a lot. Because of the poverty of the area, computers and the Internet are not readily available. Probably less than 5% of the homes have computers. The high school has a computer lab, but it is about 12 miles away. The only business in the area with a computer is the hardware store. None of the churches have computers, printers, copy machines, or fax machines. If you wanted to use the Internet, a computer, or a printer, you had to go to the library - but it was closed about a year ago. The nearest place to go is in Morant Bay - about 10 miles away, and the cost of a taxi prevents people from getting there. Private transportation is very uncommon in this part of Jamaica. Last summer, we learned that a government agency had made some computers available to a couple of community groups and they were attempting to build a community computer lab. We even visited it last Fall, but it was not complete. We would estimate they have approximately $40-50,000 USD worth of Dell computers, flat screens, desks, chairs, networking equipment, etc. Then as usual in Jamaica, there were unforeseen delays. Among them was a rent they could not afford. The lab just opened in January but is in danger of closing because they are 7 months behind on rent and cannot even pay the current rent. Many board members have abandoned it, etc. A group of very humble sincere board members approached us to see if we could help. Could we be involved? After listening to the board members, praying about it, and discussing it with our board, we believe the answer has to be "Yes." We have recognized that the poverty is only getting worse. They are falling more and more behind educationally and education is one way out of poverty. The high school students now have to do Internet research but cannot afford to travel to the Internet cafes. The churches need to print flyers, bulletins, notices. The businesses have like needs. There are programs to help the students who did not pass all the subjects in their graduation exams. There are also plans to start programs for children like computer classes. We have made a proposal to the local board controlling this. It will require them to renegotiate their lease, allow us full access to their books and board seats, and let us try to teach them better business skills. We will give them money in the short term, but much of it will be in terms of vouchers for computer use that we can distribute to the very poor and to the churches. In addition, we proposed a diminishing money match to match their fundraising and their revenues from operation. On our last mission trip, we had a mature Christian church leader, who after a few days told me she could not believe what all we were involved with, how wide our reach was, and how many people we touched. She was totally amazed. Later in the week, she said we were trying to do too much and that we needed a focus - such as basic schools. Then I asked, "Well what do we give up? Hungry children? Hungry elderly? Those in the nursing home? The special needs school? Building schools and churches? Supplying clothing, shoes, Christmas, etc? Those needing housing? She said "No - you can't give any of it up." That is our dilemma. That is where our mission is. I believe that is where God would have us. Please pray that we get the workers and the financial resources that we may show His compassion and help with His harvest. Isaiahsixeight, Inc. and IS68 Jamaica, Ltd.
Our plans for a mission team trip in the summer were canceled because of the travel concerns with the unrest in Kingston related to the drug gangster. 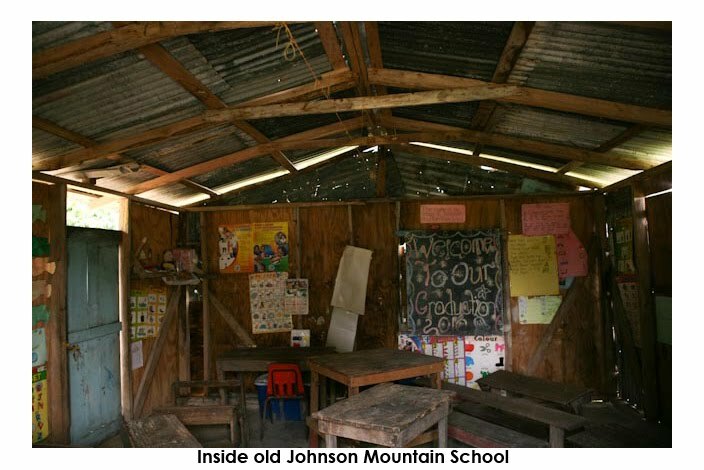 On that trip, we had hoped to demolish and rebuild a larger basic school in Johnson Mountain, a remote community in the mountains of eastern Jamaica. The last week of July, after the unrest had subsided, three members of our leadership team traveled there to check on some of the missions we sponsor and to look for other places to serve. On this trip, we carried five suitcases filled mostly with children's shoes and a few clothes. There were in excess of 200 pairs of shoes. Some of this was made possible by a shoe drive conducted by a little boy in our church who asked for shoes for Jamaica in lieu of birthday presents. Another child did the same thing, but asked for donations instead of gifts. We took some of his money and purchased kites which we took to Seaside for the children there. We again traveled to Johnson Mountain to survey that project and to make more plans (details later). Also, we continued our work with the elderly who have recently become more of a concern for us. We have helped serve them for years through our Christmas giving. We have repaired homes for some, visited some, and fed them. 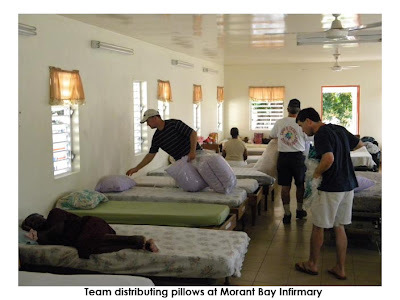 A few years ago, with the help of another mission team, we helped a private nursing home in Port Morant. 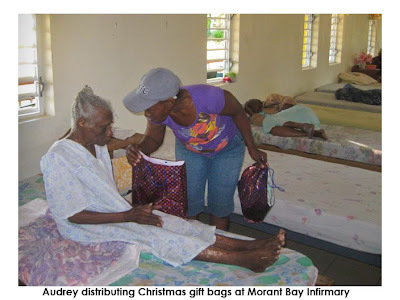 On a recent trip, we went to visit a blind lady we had helped previously who now resides in the Infirmary, an indigent nursing facility in Morant Bay. We were in for quite a shock at the Infirmary. It was extremely crowded, they had insufficient laundry equipment, the insect problem was severe, there were no operating fans, and less that one quarter of the residents even had a pillow on their bed. There was no privacy, not even curtains. The good news was that an organization that retains the profits from the Jamaican lottery had used some of its income to begin building a new building that should house about one third of the residents. With insufficient laundry equipment, there were piles of soiled laundry attracting many flies. Many residents were having to do their own laundry by hand in sinks. Seeing the conditions there, we knew we had to help even though we try to be cautious about getting involved with a government entity. However, we saw suffering and decided to get involved. While we were there, we purchased a commercial washing machine for the facility. We have also purchased 100 pillows for the residents. We are making plans to do more for the residents around the holidays, possibly make gift bags with soap, wash cloths, hygiene products, some snack food, etc. We are also trying to help a few of the elderly who are living independently, but in very bad situations. This is a little more difficult because in many cases, helping the people would require a move and many of these people would rather stay put even if moving would make their lives more comfortable. Also, their homes are in terrible shape, but we cannot improve the homes because they are rented properties. We are planning a mission team trip for January 15-22, 2011. 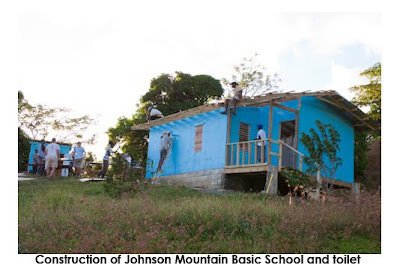 The main building project will be the demolition and construction of Johnson Mountain Basic School. We believe this will be a 3.5 day project. There is a chance that much of the team will stay in a very nice home in Johnson Mountain. This will save over an hour commute each way. This will also allow some bonding with that community. We may show movies at night there and try to do other ministry there as well. We expect there will be some of us at the mission house in Port Morant. We may have to organize the food, liquids, and materials for the work team. If we have enough people, we hope to have another team (not involved with the construction) that will be interacting more with the local community in Port Morant and surrounding area. We may put together gift bags and distribute those to the people in the nursing home as well as the poor, the sick and the elderly in the community. We may also be able to do some work in the Special Needs School and with the Basic Schools. 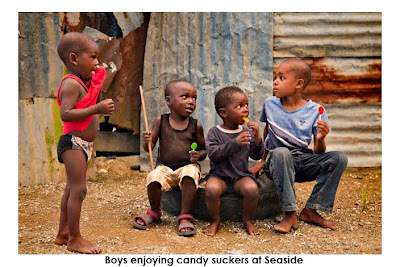 Of course, we will also be working with the poor children in the Seaside area. This is the time for Spring Break for many colleges and high schools in Alabama. We have some young college people (one who has been to Jamaica with us before) who would love to go and help lead a high school youth group. We are still working on the plans for this. Of course, the Jamaican youth will still be in school, so there will be no daily Vacation Bible School, but we could consider doing one in the afternoons and evenings or even work within the schools. The teachers in the Special Needs School would welcome any help. Also, we would probably be allowed to work in the public elementary schools and the basic schools. There is a lot of work that can be done with the elderly during the mornings as well. We can also have programs at night in the various communities. God is still showing us areas of service and need. We have recent knowledge of some areas where God is working there. We hope to join and help expand His work there. So, please be in prayer for Jamaica, its people, and that God will use us for His purposes there. "Whom shall I send?" ... "Here am I, Send me!"